When it comes to horse racing, a great deal of emphasis is put on the capabilities of the horse. But what has to be remembered when it comes to horse races, including those for the Arabian breed, is that success depends on teamwork, which includes the horse, as well as the jockey. When it comes to the Arabian horse racing circuit, there are many races that fall into the category of being impressive. One of the latest that comes to the mind of many, is the recent win of Miss Quaintly. The result of this race enticed excitement and anticipation for this filly in upcoming races. This, coupled with the fact that she comes from strong parents who have been classic winners, means she is a horse to be watched in the future. Part of the success has to go to the jockey, Jeff Lloyd, who is well recognised as an exceptional jockey, with a talent for bringing out the best in his mounts. Although, rumour has it that Lloyd is planning for retirement. The owner of Miss Quaintly is hoping this will be after he brings Miss Quaintly to glory in the spring race. Any jockey that comes in as a winner is considered impressive, at least for the day. But there are some jockeys where this has become the norm. A prime example of this is Robert Thompson who, among his many accolades, is the most victorious Australian jockey in history. To date, he has participated in 4,046 races and is still going strong. There are many who watch exciting horse races, like those that the Arabian horses participate in, but focus more on the skills of the jockey than the animal. These are individuals who have aspirations to enter into this industry. However, besides skills, there are a lot of other requirements that one must meet to qualify. One of these is weight. Most races have a weight limit that is placed on the jockey. These can vary, but a prime example is the Kentucky Derby, where the weight of the jockey can only range between 108 to 118 pounds. 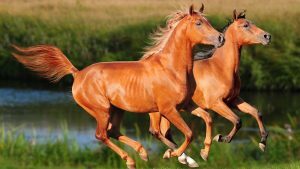 This can create quite a challenge for a lightweight individual who has to have the agility and stamina to control a high-spirited horse like an Arabian. Never the less, most jockeys have mastered this.